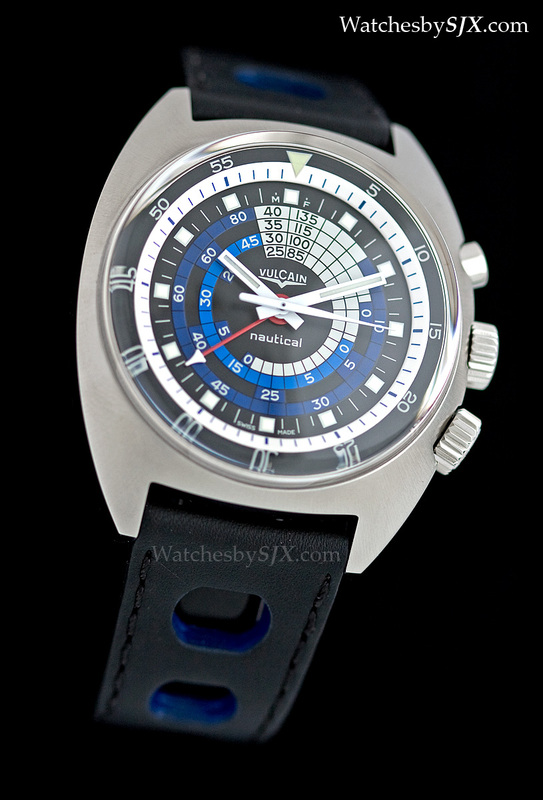 Vulcain’s remake of its diving alarm from the seventies is strikingly similar to the original. 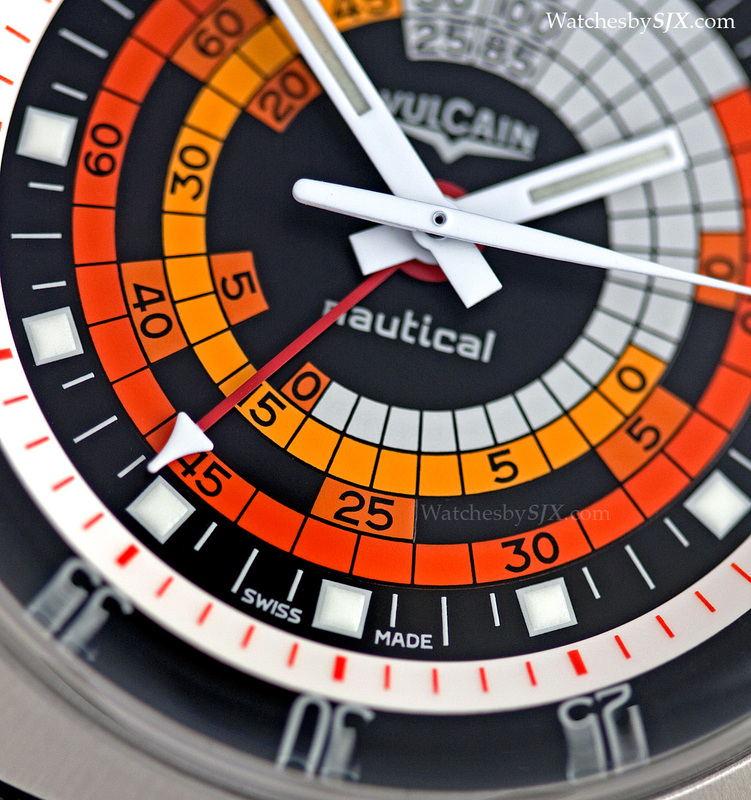 With its large, cushion-shaped case and the colourful dial, the Vulcain Nautical Seventies is typical of watches in that era. 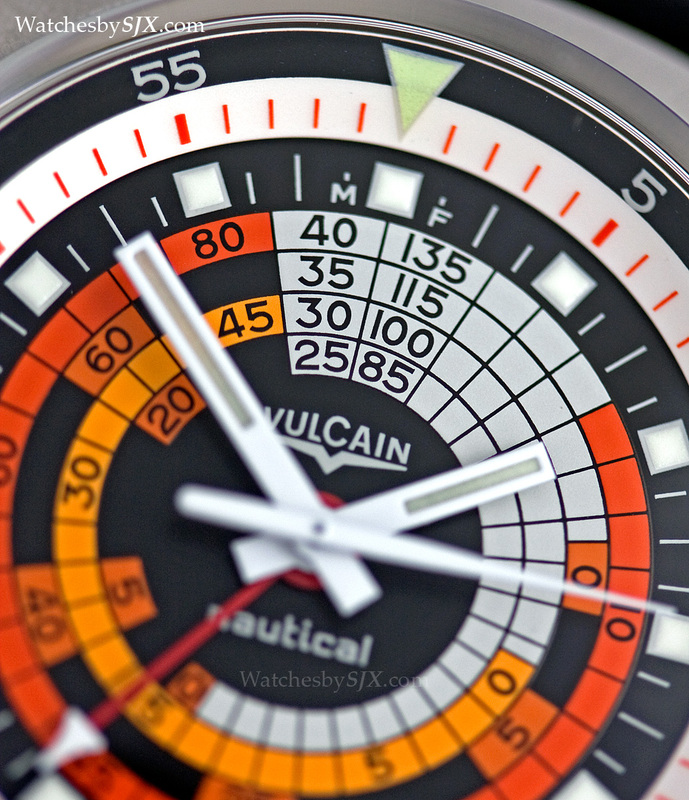 But unlike similar twin-crowned Super-Compressor dive watches of the period, the Vulcain had an additional function, a loud buzzing alarm. 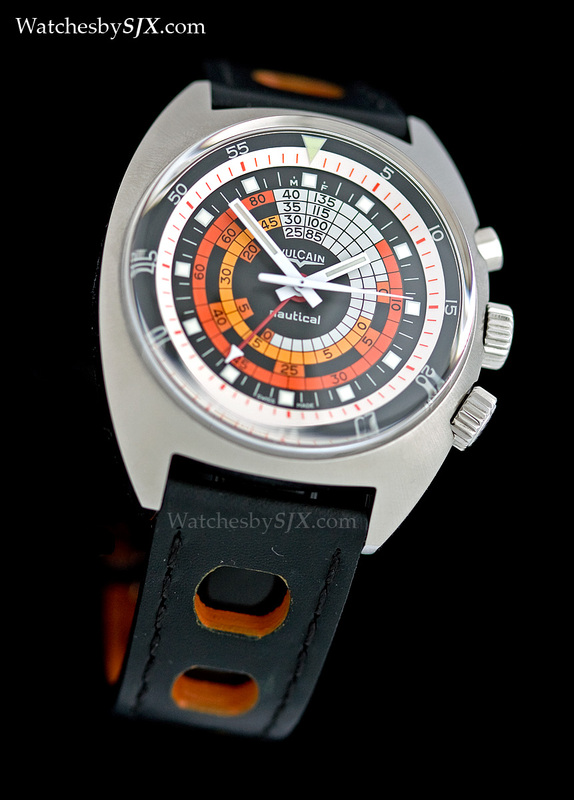 Two versions of the Nautical Seventies were presented last year. 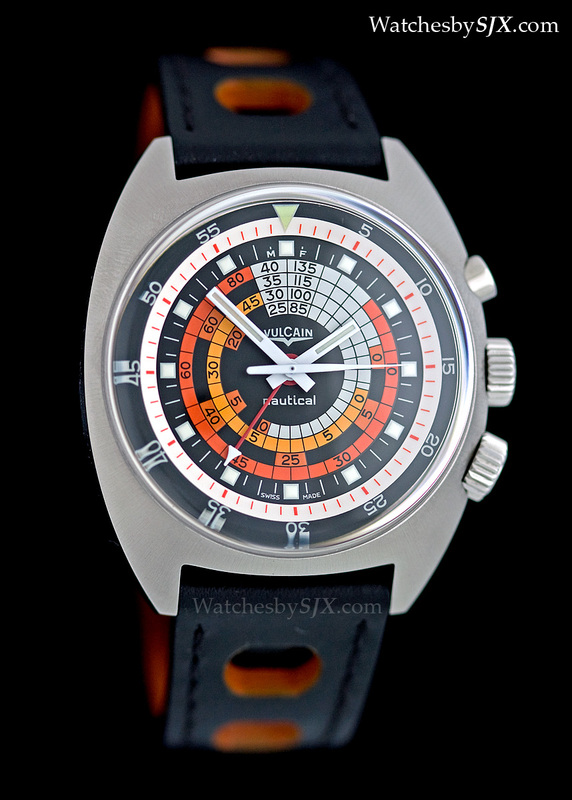 The first was a 300-piece limited edition in orange, a near perfect replica of the original. 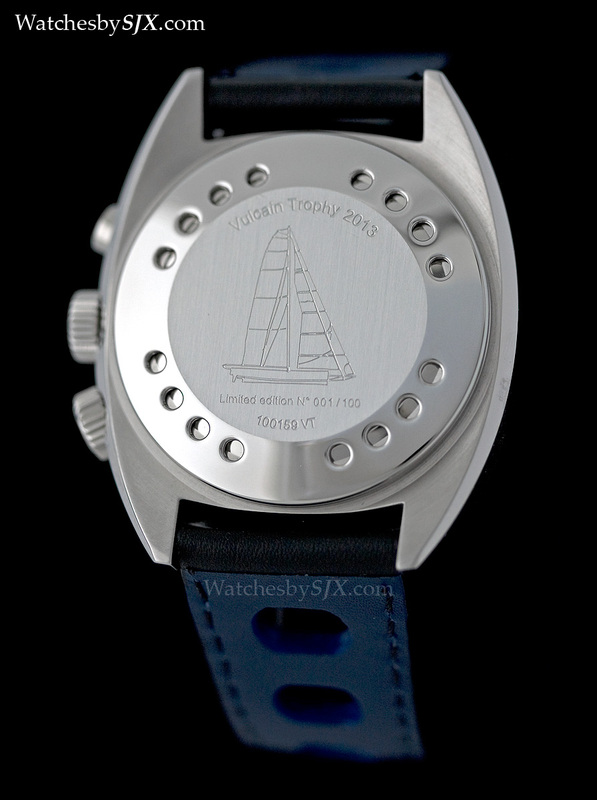 And the second was a 100-piece edition in blue to mark the 2013 edition of the Vulcain Trophy, a Swiss yachting regatta. Aside from the colour scheme, both editions are identical in specifications and also price. The Nautical Seventies has a 42 mm steel case rated to 300 m. It has a radially brushed upper surface and polished flanks, a style typical of the seventies (just like the newly announced Omega Speedmaster Mark II). Both the size and finish are identical to the seventies original. 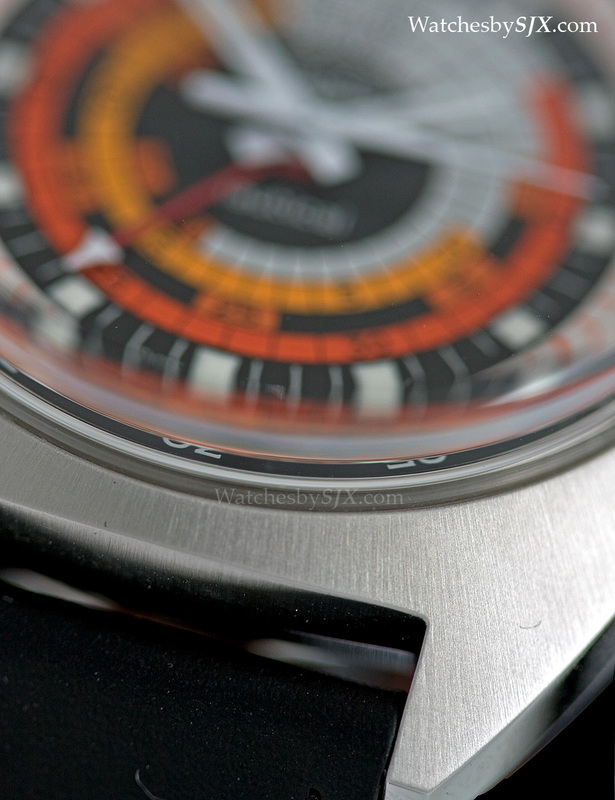 It is worth noting the case is stamped, which leaves the case edges soft, rather than sharp. 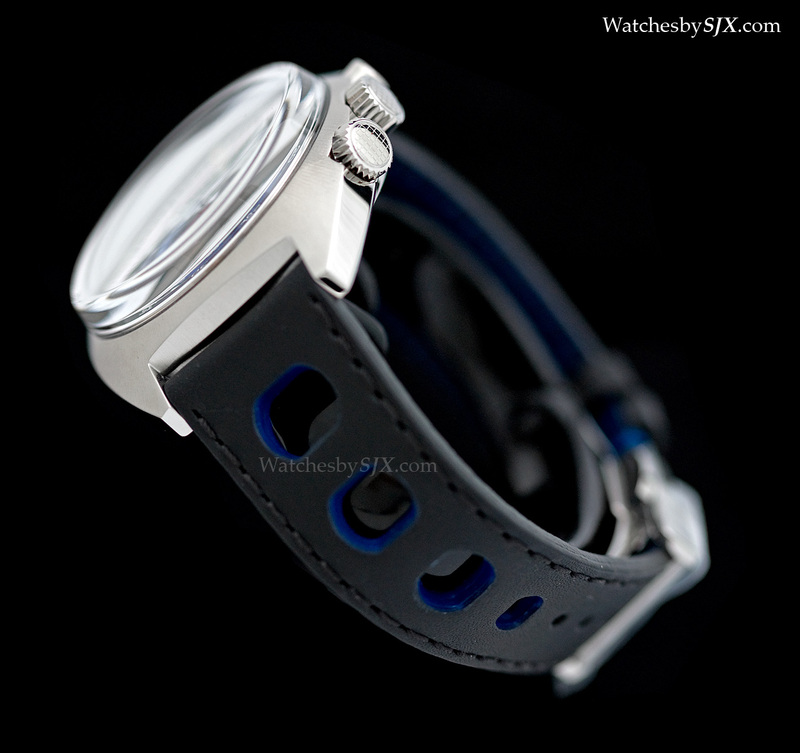 For comparison, the similarly shaped Omega Bullhead Chronograph has sharper case lines, but at more than double the price. To maximise the resonance of the alarm, the case has a triple case back, which gives it a thick 17.6 mm height. This feature amplifies the alarm, making it loud enough to be heard underwater, and to jolt someone straight out of bed. 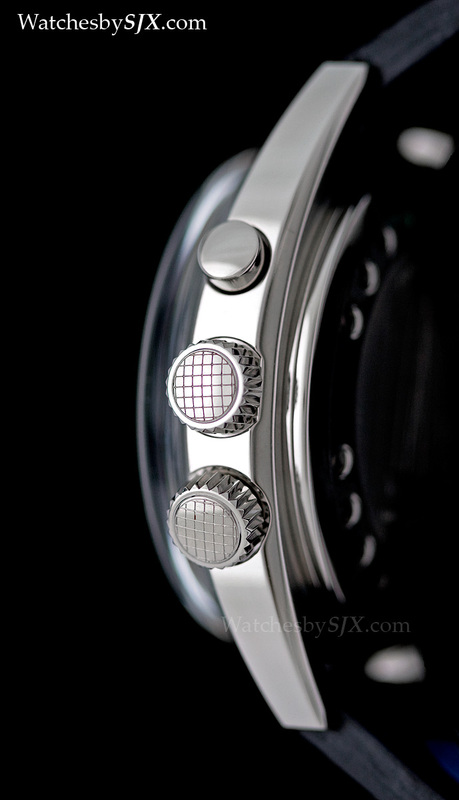 But part of its thickness is due to the domed hesalite crystal, a detail that accentuates the vintage feel of the watch. 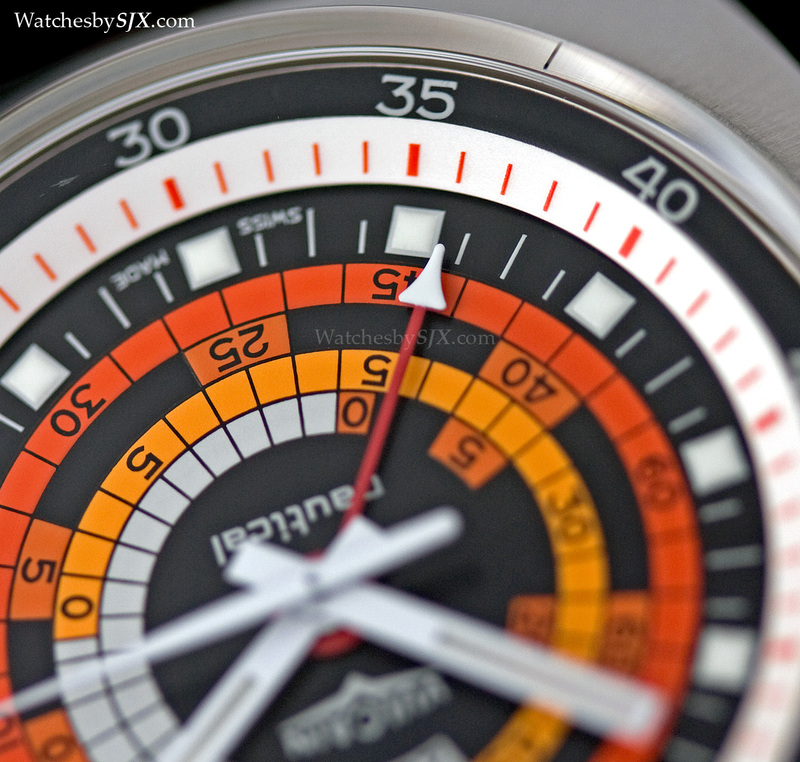 The scale on the dial is decompression table, and around it is the inner rotating dive bezel, which can be turned via the screw down crown at four. The crown at three sets the hands and alarm function, while the button at two is a function selector for the crown. 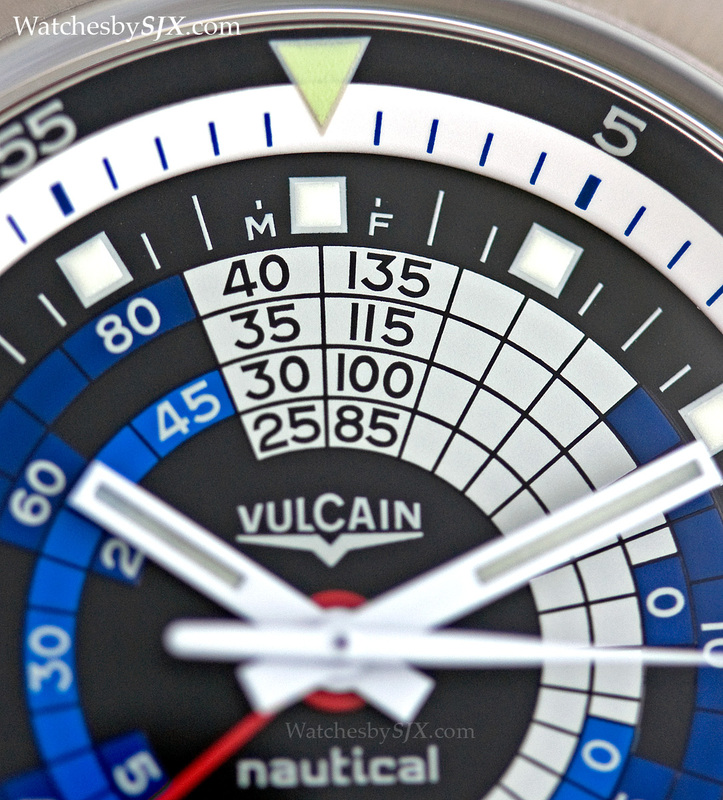 Vulcain was not the only brand to make decompression dial dive watches like this in the seventies, since the cases and dials were made by specialist manufacturers who supplied others. 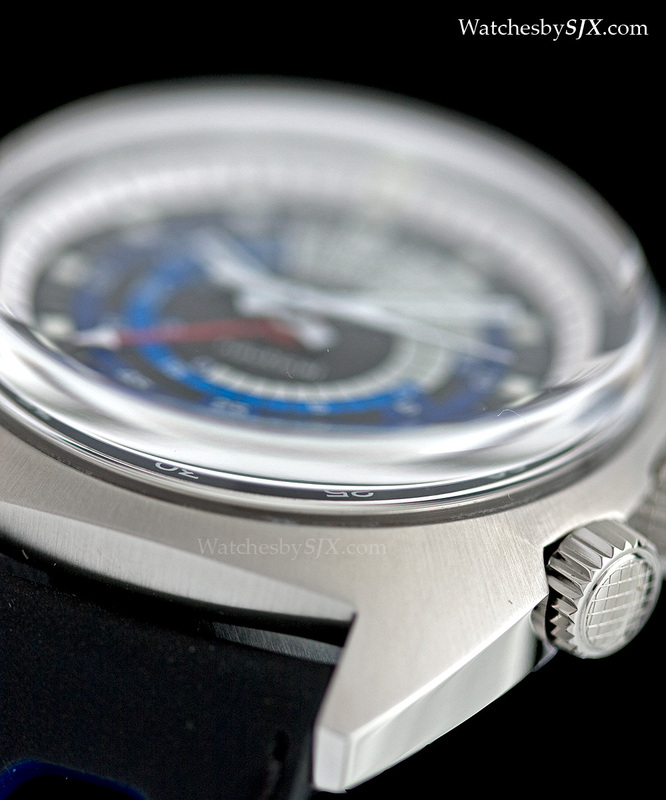 The Fortis Marinemaster, for instance, had a similar dial and case. 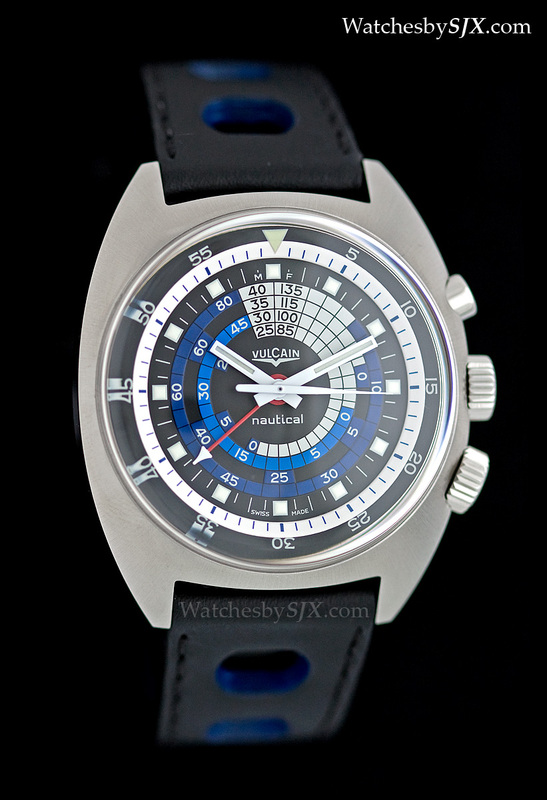 But the Vulcain was the only version of this watch with an alarm. A detail vintage dive watch aficionados will appreciate is the cross hatch pattern on top of both crowns, just like the original Super-Compressor dive watches made by E. Piquerez. 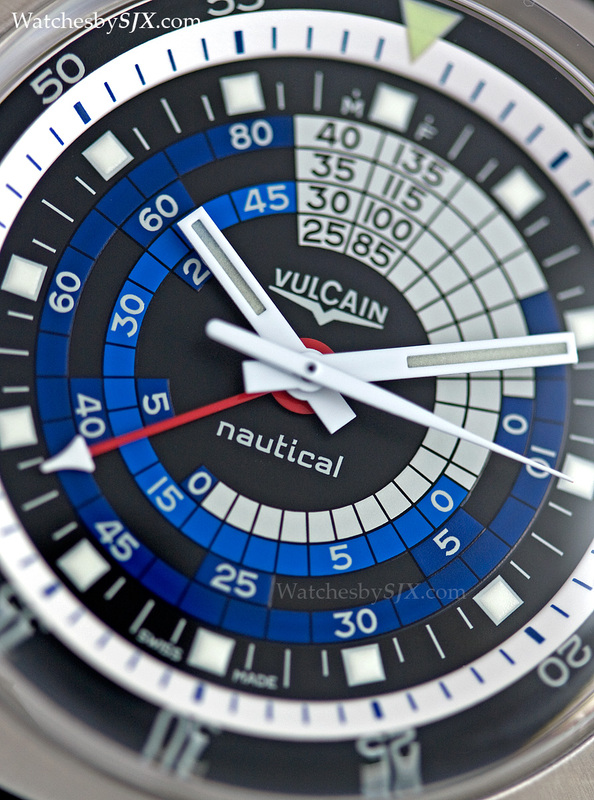 A faithful replica not just on the outside, the V-10 inside the Nautical Seventies is essentially a modernised version of a calibre Vulcain has been producing since the late forties. It’s a hand-wound alarm movement with twin barrels, one for the time and another for the alarm. The buzzing of the alarm comes from a tiny hammer striking repeatedly against a steel membrane underneath the case back. At full wind, the movement sounds for just under 20 seconds at full wind and pressing the button at two stops the alarm. 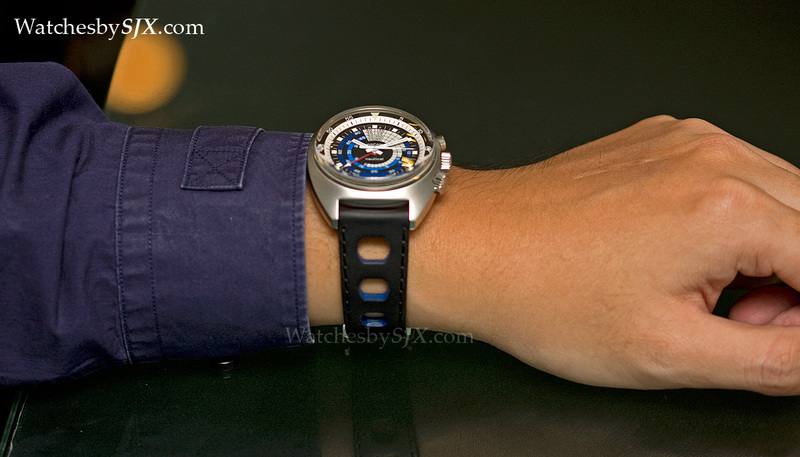 Though the movement’s durability is assured, it lacks the sophistication of modern alarm calibres. The alarm setting does not distinguish between day and might, so if the alarm hand is set to eight for instance, it will ring at 8:00 am and also 8:00 pm, as long as it is wound after each sounding. 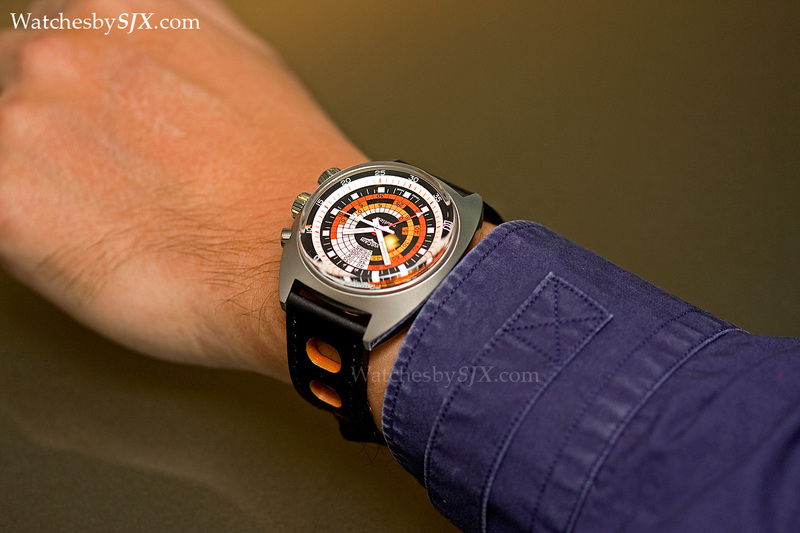 The Nautical Seventies is supplied on rally-style strap with large punched holes, which is at odds with its being a diver’s watch since such straps were designed for race car drivers. 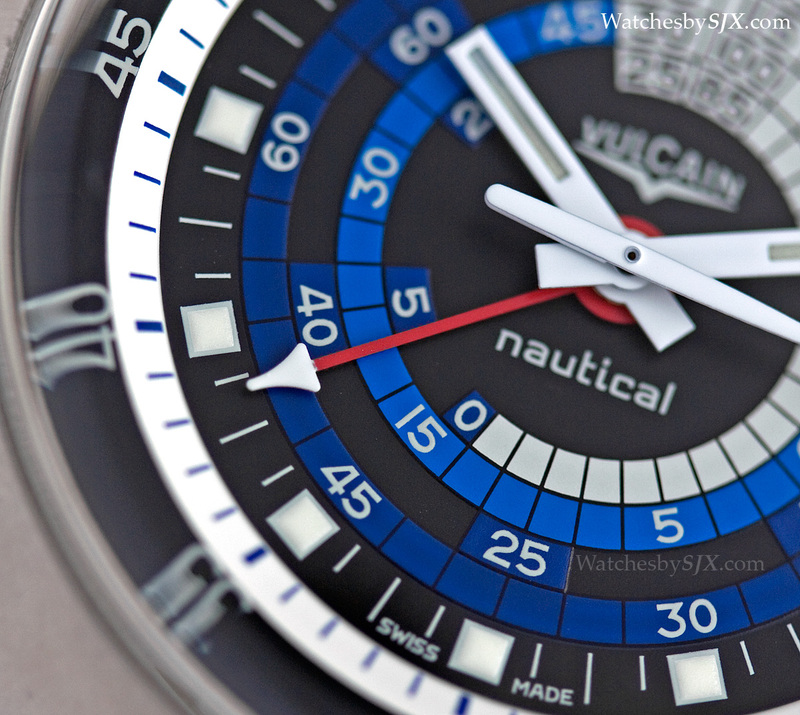 Both versions of the Nautical Seventies carry a retail price of S$6970 including 7% in Singapore, which is equivalent to approximately US$5500. 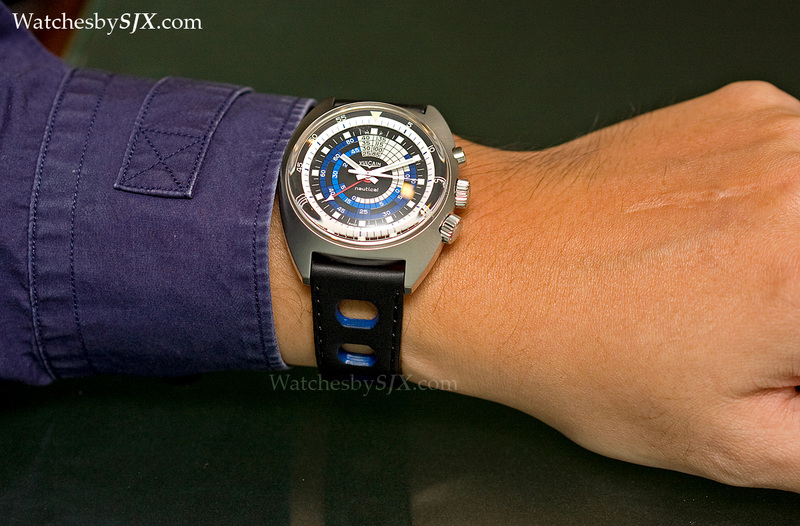 This is significantly lower than the competition, most obviously the Jaeger-LeCoultre dive alarm reissues like the Polaris and Memovox Tribute to Deep Sea, which are functionally similar.